The ancient city of Winchester is no stranger to bus rallies. By the beginning of May 2017 the city had been host to two superb events. 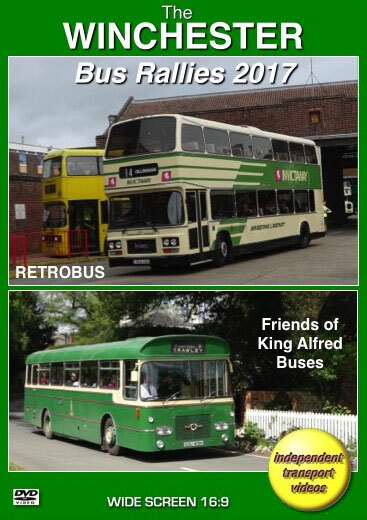 The first, ‘RETROBUS Running Day’ was organised by Hampshire Bus Preservation and took place on Sunday 19th March. It featured front entrance buses built between the 1960s and the 1990s. The second event took place on Bank Holiday Monday 1st May and was organised by the Friends of King Alfred Buses (FoKAB). This event had the usual mix of former King Alfred buses and a host of visiting vehicles, most of them having a connection with Hampshire and the south of England. The independent transport videos cameras were at both events to record the action for you to enjoy. The visit to RETROBUS was just a brief one for us. A good deal of action was recorded in The Broadway and at the Bus Station. Our cameras took a ride on former Cheltenham District Bristol RELL6L, 1003 (KHW 309E). This RE has an ECW B44D body and is painted in the attractive dark red and cream livery of the company. Further filming takes place at Friarsgate and back on The Broadway and the Bus Station. A good selection of vehicle types are present, including Bristol FLFs, REs, LHs and VRTs, Leyland Nationals, Olympians a Panther, Leopard and an Atlantean. Also present was a Daimler Fleetline and representing the modern era a Dennis Dart and Volvo B10M. The FoKAB event on the 1st of May also featured a number of interesting vehicles. The King Alfred fleet was out in force operating a network of services from The Broadway. These were helped by a good selection of Bristols, Leylands, Guys and AECs operating services to the outlying towns and villages. Our filming locations in the city included The Broadway, North Walls, Union Street, Friarsgate and of course the lovely Bus Station. We ventured out of the city to Sutton Scotney and the pretty village of Crawley to see the buses in action. Our cameras also took a ride on board 547 (PUF 647), a 1956 Guy Arab IV with Park Royal H59RD bodywork formally operated by Southdown Motor Services. You will enjoy the musical sounds of the Gardner engine and the views from the window as we travel through the Hampshire countryside on the Twyford Circular service. Our filming continues to the end of the day as we see some of the buses leaving for their homes or on return feeder services. We are sure you will enjoy these two well-organised excellent events. Well done to all for their organisation.